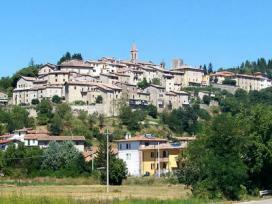 Pietralunga town, which is situated in a controlling position in the Carpinella valley, was the seat of a Roman settlement because of its strategic placement. Its present aspect, surrounded by town walls and with its well-preserved strong-hold, is however, the result of urban developement during the Middle Ages. The town's most important building is without doubt the Parrochial church which was subjected to modification during the course of the last century and therefore has its new entrance in the apsis region. Near the town's center, where, according to history, St. Crescenziano was killed, the church of Pieve de' Saddi is situated which in its interior contains frescoes dating back to the 15th century and a crypt which was restored during the 16th century.